Just like Pu-erh tea, the quality of Yan (Rock) teas from Wuyi Mountains get better with aging. For a time now, tea cakes compressed from great Wuyi teas such as Da Hong Pao have been made by some individuals for personal consumption and sometimes as gifts. Wu Yi Tea Factory is now making these tea cakes for commercial purposes. Their Wu Yi Yan Cha Bing is made using a combination of modern and traditional techniques, closely following the process used to create a once famous, Song Dynasty tribute tea cake called "Long Tuan Feng Bing" (Dragon Phoenix Tea Cake). This tea is ready for drinking now or it can be kept for further aging. Strong and full-bodied Oolong with a refreshing minty aftertaste. The tea could become more mellow and smoother as it ages. 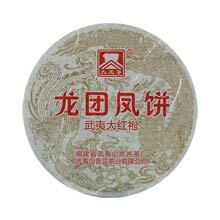 Tightly compressed small cake with the mark of Wu Yi Tea Factory's logo on the surface of the tea cake on one side. At the back is the image of a Dragon and Phoenix to represent Dragon Phoenix Tea Cake.